Good news for paraplegic patients. I have seen and treated many paraplegics patients for years and am very happy to bring this joyful news to them. Whether you are suffering from Spinal Cord Injury, Multiple Sclerosis, Head Injury, Muscular Dystrophy etc the wait can be over with this new technology known as Rex ( robotic exoskeleton)Bionics. 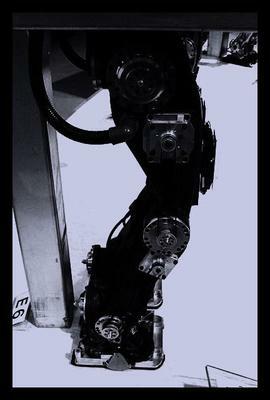 Auckland inventors Richard Little and Robert Irving have been working on Rex, the Robotic Exoskeleton, for seven years. The device serves as a pair of robotic legs for people who would normally be confined to a wheelchair. It enables the user to stand, walk and even climb steps. Some examples of paraplegic patient who successfully walked using this new technology in robotics. 1) The custom-fitted robotic exoskeleton has allowed Dave MacCalman, who sustained a spinal cord injury diving into a river while in the United States on a basketball scholarship, to take his first steps in more than 30 years. Dave MacCalman captained the 1992 New Zealand Paralympic team to Barcelona and holds the current World Record for quadriplegic pentathlon. “It is hard to describe what it has been like to be back on my feet again. I’m six-foot-four so it’s been amazing to experience life from that height again. I’m looking forward to taking my Rex home and being able to stand around and socialize with family and friends,” said MacCalman. 2) Wheelchair-bound Ajit Jogi to get robotic legs soon. Senior Congress leader and former Chhattisgarh Chief Minister Ajit Jogi, who has been wheelchair -bound since a road accident in 2004, may be able to walk soon again with the help of robotic legs. A team from Rex Bionics of New Zealand will be visiting him at Raipur on March 16 to enable him use this contraption, he said on Sunday. He would be the first Indian to use it, Jogi said. According to Jogi, the contraption uses advanced robotic technology to help those with impaired limbs to stand, walk, even climb stairs and slopes. The training on how to use it, and trials, were likely to last 7 to 10 days, he said. 3) Elena Bertoldo, who was diagnosed with a spinal problem at birth, has travelled from Italy to the two Scottish engineers' home town of Fort William to try them out. This impressive development comes with a hefty price-tag, with an expected retail cost of around $150,000. Due to the steep price Rex Bionics pointed out that the freedom, social, health and general lifestyle benefits this development can offer wheelchair users is one that will require an individual assessment. So to sum up paraplegic spinal cord injury patients can afford to laugh with Rex bionic until the long awaited Stem Cell Therapy Research is successful. May I ask you to place some ads of my site halloweencostumesmax on you blog? Return to Physical Therapy News.